Trading Journal Spreadsheet gets excellent marks for features because there simply isn't anything else like it on the market. It's a little expensive for what it is. However, those who take their trading seriously will find it to be an invaluable tool. After the initial setup, the basic and most important features of TJS, in my opinion (logs and analysis), are very easy to use. I've only spoken to Greg a few times, but each time he's responded very quickly and professionally. ​Summary: Trading Journal Spreadsheet (TJS), the excellent trading journal solution from Greg Thurman, is a detailed trade tracking tool for those that are serious about becoming better traders. There simply isn't another trading journal solution like this on the market at this time. The one-time price may seem steep to some, but the ability to accurately track and analyze your trades in detail will be an invaluable tool to any serious trader. The trading log covers all the details of the trade that most traders would ever need or want to log, but if you'd like to add or subtract any fields, the trading log is completely customizable. The trading log and tracking sheet work together to produce the real gold of TJS, which is the detailed analytics screen. Through this advanced analytics solution, TJS is able to provide insights which far outshine what a typical trading journal can provide. Forex market only $119.99. All markets $179.99! Why Do You Need to Use a Trading Journal? 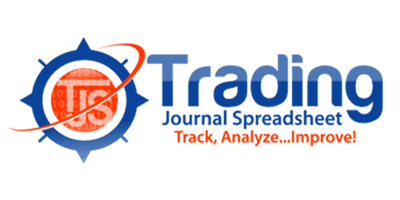 Is Trading Journal Spreadsheet Right for You? Many traders are now tracking their trading accounts with third-party tools like Myfxbook. While I do recommend tracking your accounts this way, performance tracking is not a substitute for keeping a trading journal. If you don't keep an accurate trading journal, you'll have no way of reviewing your trades at a later date. All serious traders review their trades to learn from them. This is especially important if you're not consistently profitable yet. ​The minimum information you should be recording is the date, time, instrument, direction, strategy, entry, exit, stop loss, target, and trade size. All of this information is essential to help you recreate the trade for review later on. With Trading Journal Spreadsheet, you can record all of this and much more. Plus it helps you quickly analyze all of your information in a way that can help you drastically improve your trading performance. In this Trading Journal Spreadsheet review, I'm going to show you some of the most important features and how these can improve your trading, but first you should decide if you're the type of trader that will actually benefit from using an advanced trading journal. Using a trading journal is one of the best things you can do to become a profitable trader. Reviewing your trades at the end of each week or month really helps to beat out the psychological kinks that keep you from profiting consistently, while simultaneously refining your trading strategies. All of the features that Greg has packed into Trading Journal Spreadsheet make it much more than just an easy-to-use way to log trades for review at a later time. Whether or not it's right for you really depends on how serious you are about becoming a consistently profitable trader. What sets Trading Journal Spreadsheet apart from a typical, simple, user-made trading journal? The difference is night and day for many reasons, but in this review, I want to focus on the two most important features of TJS from my perspective. The trading log is very robust compared to any other trading journal that I have used or created. For example, it's capable of recording 32 different pieces of information on a single Forex trade (including a screenshot and not including scale in/out info) by default. Of course you don't have to fill out every piece of information on every trade to make use of Trading Journal Spreadsheet. However, I recommend that you input as much information as you can on each trade. It will be beneficial to you during your review and analysis. The default input cells are probably more than enough for most traders to record their desired information. If not, don't worry - the trading log is completely customizable. This means that you can add or delete input columns until you're satisfied. The main advantage to using an advanced trading journal is the ability to quickly analyze your trades to find strengths and weaknesses in your trading plan. This has nothing to do with the psychological aspect of your trading, but it's just as important. The trading log is sufficient for identifying psychological mistakes or habits that you make which should be cut out of your trading routine. However, this type of analysis goes a step further. 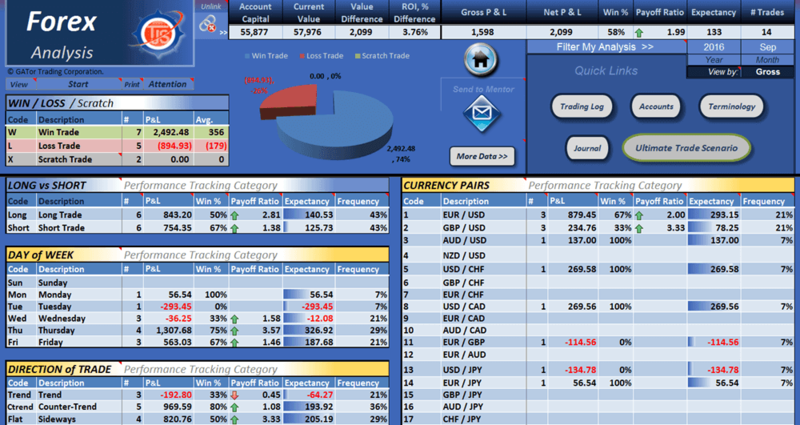 ​Trading Journal Spreadsheet allows you to analyze your trades in many ways. You can find out which pairs, what times, which days of the week, which direction (long or short), which strategies, which time-frames, etc., work best or worst. You can even filter the results by year or month. ​For instance, from the image above I can determine that I had better win rate on short trades in September. That makes sense because I usually have a better win rate with short trades. However, I probably wouldn't know that if I had never used a trading journal. I can also see that I had an 80% win rate on counter-trend trades, like the stop run trades we do at Day Trading Forex Live (DTFL). I can also tell (farther down the page) that the DTFL strategy was my highest earning strategy and that it performed better on the Euro than the Pound. The idea is to keep track over an extended period of time. If you identify any recurring weak spots in your trading plan, you can use this analysis to eliminate the pairs, time-frames, strategies, etc., that cause you to lose money and keep those that give you an edge. In addition to the two main spreadsheets, Greg has also designed some helpful, additional sheets. The position size calculators, like I mentioned earlier, are useless to me, but some of these additional sheets are very handy. For instance, the "Expectancy" sheet, like it's name suggests, can give you an idea of what to expect from your trading plan. It works by simulating 100 random wins and losses based on a handful of criterion that you enter (strike rate, payoff ratio, commission, and starting balance). You can use this to get an idea of an expected result of your next 100 trades based on the performance of a smaller sample of trades. You can also use this sheet, in conjunction with the advanced analysis sheet, to see the theoretical performance of your trading plan after eliminating the things that diminish your edge in the market. What Are Other People Saying About Trading Journal Spreadsheet? If you're trading, you should be using a trading journal. Next to a profitable trading system and good money management, using a trading journal is the most important thing you can do to become a successful trader. 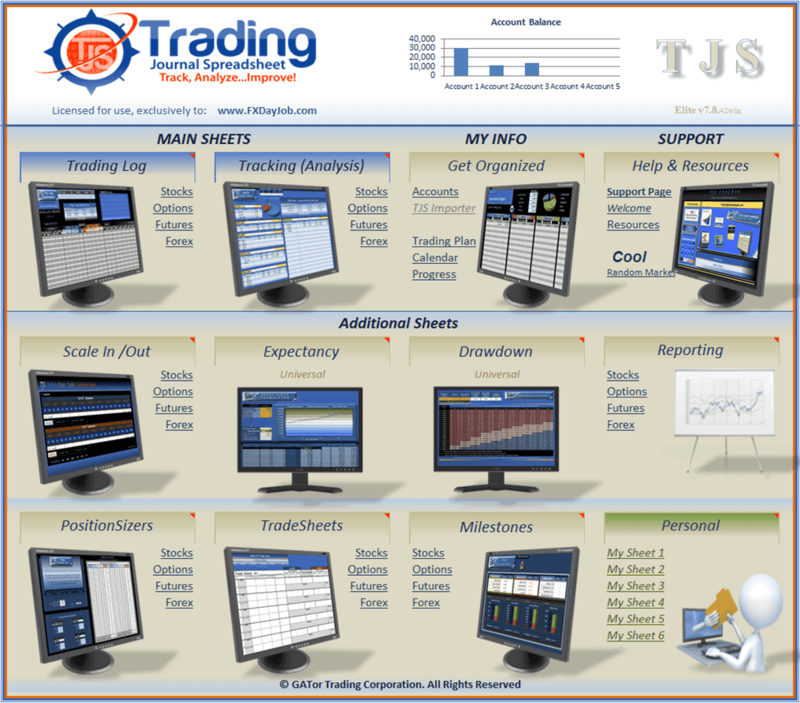 In this Trading Journal Spreadsheet review, I've showed you some of the most important features and benefits of TJS. Now that you know what I think about it, take a look at what some other Trading Journal Spreadsheet users have to say. Summary: Trading Journal Spreadsheet is made to benefit serious traders. The trading log is expertly designed, yet fully customizable. The analytics produced by this advanced trading journal are designed to drastically improve your trading performance. Although it's not a standalone product (requires Excel), and although I find the position size calculators to be pretty useless, the key features of TJS are gold. I have no doubt that it will improve the performance of any serious trader that uses it. Open Office has a free spreadsheet app for Windows which you can import the Excel spreadsheet template product. Thanks for the suggestion, Rick. I recently found out that you can do the same thing with the free Office Live online as well.